Today, September 18th, marks six months since Derek's death. How can it be that long, when it still feels so recent? Many of us were knocked off our feet on that day. But then we mourn, and then our mourning grows feet, and we get up and keep walking. As I take baby steps into this new chapter of life, I am experiencing a full array of emotions, calling on inner resources and showing up for myself in ways I could not and would not have understood when I was younger. I know this might sound strange, but the grieving process is rich. After Derek's wife Lin died in 2007, he wrote the following words: "... grief has washed over me like a wave, rolling in, retreating, jarring me, cleansing me. Sometimes the waves threaten to take me under. Then I see Lin with those big, loving, accepting blue eyes, her comforting smile, and her gentle voice, telling me to wash my tears, take a step outside, and LIVE." Even though I have lost parents and friends, losing a spouse is something else entirely. But I watched Derek do it, and that is a source of great strength and comfort. In my mind, I see Derek's big smile, I feel his loving hands, and most of all I hear his laugh, as he reminds me not to sink too deeply into grief, and to continue to have fun. Derek went on to write this: "I imagine the day when I myself pass on and leave my friends and family behind. What would I wish for them? Obviously I could understand them missing me, but then I would want them to live, I mean really live… fully and authentically." And this is what I am doing, and not too badly, all things considered. I am getting out there, going to an event or two, taking a workshop on meditation & the brain, making videos, and I have even taken a couple of road trips on my own, visiting friends and family. Not easy, but how rewarding! What I find is that I am surrounded by love. And there is so much out there that still interests and excites me. I am alive! There are setbacks, though, too. Recently I had a health episode that completely overwhelmed me. I had some strange physical symptoms, which in turn triggered anxiety attacks. A new and scary thing for me! But I held tight to the knowledge that anxiety is a natural adaptive response to extremely unfamiliar sensations. It doesn't take much to freak out from there! I was tested for cardiovascular problems, hormones, all the vitamins from A to Z - you name it! It turned out to be a chiropractic issue. But the experience revealed that I am still vulnerable, and there are anxieties that go way back to childhood. It was painful and scary to go through without Derek, and I am fairly sure it wouldn't have happened if he were around. What an emotional rock he was for me. But I am so proud of myself, to get through it with a relatively clear head, and find my truth. Coming home from the chiropractor, having my first sense of physical relief, I enter the house that Derek and I created together. You might think it difficult for me to come through that door. And it has been at times. But I am coming home to the warmth of memories, that although they make me cry, are also like a balm. With every tear comes a smile, and many times a laugh. By letting grief flow freely, I am cleansed, to experience the world and all its beauty anew. For many, the loss of a spouse means the loss of hopes and dreams for the future. I am so thankful that Derek and I lived very much in the moment. Yes, we also lived as if we'd have an eternity together, but always with the knowledge that things could change in a heartbeat. After all the losses I've had, this knowledge is deep in my bones, and this does not make me sad. Bittersweet, yes, but not sad. I always come back to gratitude for my best friend, my husband, and the rich time we spent together. Rarely do I feel, "Why now?" The cosmic joke is more like: "Oh, when you said live in the now, you meant NOW!? OK then." I laugh, and then accept. It's the only way through it. Which isn't to say it's easy. It has gotten harder, in fact. In the beginning everything was so clear-cut. There is no way to change reality so you go with it. There are things to do and take care of, and I knew well how to proceed. But as time goes on, there is less to do, and more time to feel the loss. Derek really never is coming back. We were "Derolyn" - no longer just Derek and Carolyn. And now one half of Derolyn is no longer here in physical form, and that is devastating. It's not as fun reciting our silly banter alone. Cuddling myself is definitely not as enjoyable. I can't sing harmony with myself. It is NOT the same, even if he is here in spirit. All our unique ways of doing things, our secret lovers' language, our playfulness, our intimate conversations - exist only in memory now. I miss it all. I miss him like crazy. I miss "UZ". I can hear Derek right now saying to me, "It's all attachment, Carolyn...." But that's easy for him to say! I think the missing will always be there. One of the most challenging things for me has been to navigate the stream of other people's ideas on how I should be grieving. I rest easy knowing it all comes from a place of love and caring, but almost everyone, whether they have lost a loved one or not, has an opinion. One of my friends from choir, a man who has just celebrated his 50th wedding anniversary, advocated keeping as busy as possible. Another advises diving into the pain as the way to heal. Others tell me to remember only the happy moments. I am thankful to know what works for me, and that is BALANCE. As Derek would say, "Feel everything, try everything, go everywhere, but don't stay too long!" Last month at the bench in Irvine's Landing on the Sunshine Coast in BC, another plaque was put up. 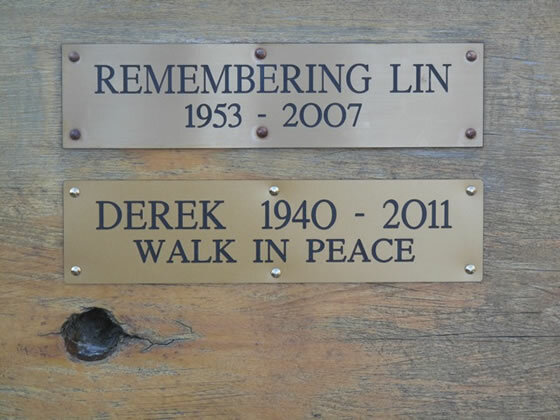 August 26th was Lin's birthday and also Derek & Lin's wedding anniversary; a small group gathered there to remember them both, to scatter ashes, and to declare the bench now both Lin and Derek's. If you ever want to go take a visit, I can tell you how to get there! On the same day I went for a little hike up neighbouring Pender Hill, where I used to go and look down at their house. The view of the forest, mountains, lakes and ocean is glorious! !